By associating herself with this propagandafest Sturdy-Colls loses all credibility as a serious historian, as also does David Cesarani, but I don't think he ever had any. I like the way that they repeatedly remind the viewer that the Bolsheviks are dramatizing and falsifying the footage of uncovering graves for maximum effect but assuring the viewer that there is no falsification of who the victims are and who the murderers were. The 1 million+ Poles who were rounded up and transported east all just decided to live their lives out in scenic Siberia, none of them ended up in pits. Anyone in a pit is a Jew. You can trust the Soviet propaganda team, forget Katyn, that's just something different, that's not something to bear in mind, in fact don't even mention it in the documentary, no sense in clouding the issue with stuff like that. At the 25:00 mark the victims of the mass shooting that the producers insist are Jews (no women or children in the grave just men) are being mourned by people carrying crosses. If this was a Jewish town you would think there would be a synagogue in view, maybe a star of David or two, a Rabbi brought in, some prayer shawls, something Jewish, anything at all that could be related to Jews. The women don't look anything like you would expect, they're all dressed like Russian peasants. Yet these people are the relatives of Jews found shot in a mass grave, even though the accusation is that the Germans murdered whole communities, men women children and babies. In most of mass graves there is a the total lack of women and children, not just at the 25:00 mark as pointed out by cold beer. If these graves show the genocide of an entire population it was a population almost exclusively of military age men. Since Stalin prohibited the evacuation of besieged Stalingrad, the civilian population starved and died by the thousands during the battle for that city. There were undoubtedly plenty of women and children victims of war which would easily account for the few women and children shown in the videos. Great post, caught in the act of their lies on video. From the 17 minute mark, it shows German footage of an execution in Yugoslavia. Turns out this footage was shot in Pancevo, Yugoslavia in April, 1941. The quote below was posted on AHF. Whilst bearing in mind the poster may have been a bit biased, it still shows that the footage was not shown in context in the documentary this thread's about. The German film also contained footage of the funerals of the Germans who had been murdered by partisans, and this is not mentioned, let alone shown in the documentary. Yugoslav forces had cleared Pancevo on 12 April 1941. On their retreat they killed nine Germans (Volksdeutsche/sog. Donauschwaben). Their bodies were found outside the village and taken back into Pancevo. There was a funeral for those killed on the morning of 22 April 1941. A military band of the Wehrmacht participated. In the meantime the regiment "Grossdeutschland" had arrived in the area of and around Pancevo. With the exception of a medical company there where no SS units anywhere around Pancevo. After "Grossdeutschland" had arrived there were several incidents involving snipers against German soldiers, mostly shooting from the villages cemetary onto a road used by German messangers. Two members of "Grossdeutschland" where killed. The German "Standortkommandant" Oberstleutnant v. Bandelow, issued the following public order: "There have been repeated attacks and snipings against German soldiers in violation of international law. For every wounded or killed German soldier 10 Serbs will be hanged. If this still doesn´t stop the sniping we will double the number to 20." During a search of the cemetary´s catacombs and a nearby restaurant the Wehrmacht soldiers arrested several ARMED citizens/civilians. Because the "Grossdeutschland" had no own military judge, the judge of the next Division, "SS Reich" was ordered to take up the case (SS-Sturmbannführer Rudolf Hoffmann). A regular German military trial was held and 36 Serbs were found guilty, 4 were not found guilty and released. They guilty were all sentenced to death according to the rules of landwarfare (Haager Landkriegsordung). The delinquents that wore there weapons open were sentenced to death by shooting, those who wore them concealed were sentenced to death by hanging. The firing squad (Exekutionskommando) was formed under the command of the leader of Pionierzug III/GD. For every delinquent there were two German soldiers in the firing squad and the Leutnant was responsible for any "Fangschuss".The others were hanged by civilians the ethnic German Hermann Brumm und an Hungarian citizen. The whole execution was filmed and photographed by PK-man Gottfried Kessel of "Grossdeutschland". After the war the whole incident was investigated by the German state attorneys in Munich and Darmstadt. On Sept 28th, 1973 the case against the SS judge Rudolf Hoffmann was closed and he was not found guilty of a crime because "from documents and witnesses we came to th result that the people killed on April 22 1941 in Pancevo were partisans. Such partisans could be sentenced to death according to international law. They were killed after the surrender of the Yugoslav army on April 17th 1941." Source: Post, Walter "Die verleumdete Armee"
(b) A report of Alfred Rosenberg to the Reich press office in September 1941 mentioning deaths in the Warsaw ghetto and citing Frank's opinion that the Jews should be deported into Russia (45.40). (c) More familiar documents, principally Himmler's Posen speech of October 1943. (c) Several mass graves taken by Soviet film crews, including at Rostov, Kharkov, Smolensk and Kiev (Babi Yar). (b) Aerial motion footage of Auschwitz and ground footage including a pile of Jewish prayer shawls. The voice over contains constant, anachronistic references to "the holocaust" that jar with the Soviet newsreel interpretation that describes the victims as Soviet citizens. This is explained by the Russians' wish to remember their own dead. There are some very undeveloped remarks about changes in the narrative of the war over the years, e.g. the dismissal of Soviet footage during the Cold War; and a few platitudes about the lessons we can draw from the past. At the 18:50 mark the documentary quotes a single line from Heydrich's famous memo of Sept 21, 1939, set to sinister music. Whilst the effort is clearly to dupe the average couch potato into thinking the "final aim" is the murder of all Jews in the Soviet Union, the memo was written 21 MONTHS prior to Germany's invasion of the USSR and actually concerns the, not very nice but hardly holocaustistic, Nisko-Lublin plan. cold beer wrote: At the 25:00 mark the victims of the mass shooting that the producers insist are Jews (no women or children in the grave just men) are being mourned by people carrying crosses. I didn't see the crosses you refer to, but around 26:35 there is a burial service... at a church! And, I agree, all the people appear to be Russian peasants. That part is very significant as that grave in Rostov was claimed to contain 12,000 Jews according to the documentary, yet we only see perhaps 25 bodies from it. Unlike virtually all the other mass graves that Action 1005 supposedly later went to, unearthed all the corpses and cremated them, Action 1005 aren't claimed to have done that to the "Ravine of Snakes" mass grave in Rostov. 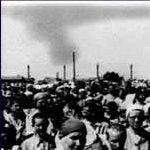 One of the original claims was that the Jews in Rostov were electrocuted with barbed wire. NARRATOR: Very little indisputable evidence has survived of Babi Yar. Some footage attributed to the atrocity has been shown to come from elsewhere. So when he first saw these images Jeremy Hicks could hardly believe his eyes. DR. J. HICKS: I was asking myself the question "Is this really Babi Yar, could this really be Babi Yar?" Then on looking at the footage of the Soviet prisoner of war who'd escaped after being forced to, er, dig up and burn the bodies by the Nazis. Where he actually says "this is Babi Yar." I mean, I was absolutely shocked. I hate to be the one to burst Dr. Hicks' bubble, but the footage he thinks he discovered, is already well known. The Soviet PoW sonderkommando he mentions is Vladimir Davydov (Jewish), and the footage features in the 1985 film Babi Yar: Lessons of History by Clarissa Henry for Ukrtelefilm (Ukrainian Studio of Television Films). Right here in this Babi Yar, stood the furnaces, the stench was unbearable. We were ordered to carry the bodies, and on order of summary execution, to stack them on the platform of the furnace. Here they brought people, naked women and children put to death in mobile gas chambers. But the sheer scale of Babi Yar meant that there were just too many bodies to burn. After which the images above appear. Are they seriously claiming that the Soviets shot this footage of these corpses at Babi Yar? American journalist William H. Lawrence was shown around Babi Yar by the Soviets on October 22, 1943, only days after the Soviets had captured the territory and whilst the Battle of Kiev still raged. Lawrence was sceptical of the Soviet claim that up to 80,000 corpses of murdered Jews had been unearthed and cremated in the ravine just a few months earlier. We did see a few isolated bones, including a skull, some matted hair, a shoulder bone, an arm, a gold tooth, bridgework and some spots on the ground which were told was the blood of the prisoners who were shot by the Germans after the Jew-body burning had been completed. There were spectacles cases, handbags and other evidence left in Babi Yar. Scrapping the barrel of abject stupidity at 49:28, the narrator claims that this room in Majdanek's Block 41 is a gas chamber disguised as showers, and that "Ziclon B" was used in these showers. This room is not now, nor was it ever claimed to have been a gas chamber. It's got FIVE large windows in it. The footage of Sonnenberg prison is fairly shocking. The narrator claims the bodies "were left lying where they were shot," although they seem to created a sort of path. The narrator also claims that 4,000 were shot shortly before the camp was due to be liberated. Although another source (Hitler and Nazism by Richard Geary) states it was 800 and that this was no camp, but a prison. Surprisingly few mentions of this massacre in books written in English. The image below's from wiki, also claiming it was taken in a camp. I do not see a single speck of blood. Sonnenberg ... proof? Or staged victims of the communists? Recall the victims of Allied bombing at Neuengamme that were displayed and blamed on the Germans. I do not see a single speck of blood. Sonnenberg ... proof? Or staged victims of the communists? Do you have any evidence that this was staged by the Soviets or even that the footage was used propagandistically? Hannover wrote: Recall the victims of Allied bombing at Neuengamme that were displayed and blamed on the Germans.